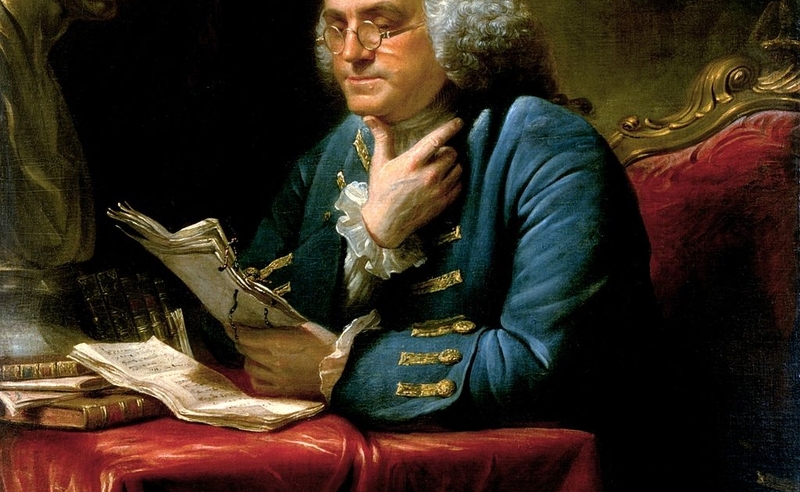 A 1767 portrait of Benjamin Franklin by Scottish artist David Martin. While many of the founders of the United States were immigrants or the children of immigrants, that does not mean that all of them expressed tolerance toward newcomers, particularly toward newcomers that they perceived as not like them. Europe is generally full settled with Husbandmen, Manufacturers, &c. and therefore cannot now much increase in People: America is chiefly occupied by Indians, who subsist mostly by Hunting. But as the Hunter, of all Men, requires the greatest Quantity of Land from whence to draw his Subsistence, (the Husbandman subsisting on much less, the Gardner on still less, and the Manufacturer requiring the least of all), The Europeans found America as fully settled as it well could bee by Hunters; yet these having large Tracks, were easily prevail’d on to part with Portions of Territory to the new Comers, who did not much interfere with the Natives in Hunting, and furnish’d them with many Things they wanted. ….There are suppos’d to be now upwards of One Million English Souls in North-America, (tho’ ’tis thought scarce 80,000 have been brought over Sea) and yet perhaps there is not one the fewer in Britain, but rather more, on Account of the Employment the Colonies afford to Manufacturers at Home. This Million doubling, suppose but once in 25 Years, will in another Century be more than the People of England, and the greatest Number of Englishmen will be on this Side the Water. What an Accession of Power to the British Empire by Sea as well as Land! What Increase of Trade and Navigation! What Number of Ships and Seamen! We have been here but little more than 100 Years, and yet the Force of our Privateers in the late War, united, was greater, both in Men and Guns, than that of the whole British Navy in Queen Elizabeth’s Time…. And since Detachments of English from Britain sent to America, will have their Places at Home so soon supply’d and increase so largely here; why should the Palatine Boors [Germans] be suffered to swarm into our Settlements, and by herding together establish their Language and Manners to the Exclusion of ours? Why should Pennsylvania, founded by the English, become a Colony of Aliens, who will shortly be so numerous as to Germanize us instead of our Anglifying them, and will never adopt our Language or Customs, any more than they can acquire our Complexion. Those who come hither are generally of the most ignorant Stupid Sort of their own Nation, and as Ignorance is often attended with Credulity when Knavery would mislead it, and with Suspicion when Honesty would set it right; and as few of the English understand the German Language, and so cannot address them either from the Press or Pulpit, ’tis almost impossible to remove any prejudices they once entertain. Their own Clergy have very little influence over the people; who seem to take an uncommon pleasure in abusing and discharging the Minister on every trivial occasion. Not being used to Liberty, they know not how to make a modest use of it; and as Kolben says of the young Hottentots, that they are not esteemed men till they have shewn their manhood by beating their mothers, so these seem to think themselves not free, till they can feel their liberty in abusing and insulting their Teachers. Thus they are under no restraint of Ecclesiastical Government; They behave, however, submissively enough at present to the Civil Government which I wish they may continue to do: For I remember when they modestly declined intermeddling in our Elections, but now they come in droves, and carry all before them, except in one or two Counties; Few of their children in the Country learn English; they import many Books from Germany; and of the six printing houses in the Province, two are entirely German, two half German half English, and but two entirely English; They have one German News-paper, and one half German. Advertisements intended to be general are now printed in Dutch and English; the Signs in our Streets have inscriptions in both languages, and in some places only German: They begin of late to make all their Bonds and other legal Writings in their own Language, which (though I think it ought not to be) are allowed good in our Courts, where the German Business so encreases that there is continual need of Interpreters; and I suppose in a few years they will be also necessary in the Assembly, to tell one half of our Legislators what the other half say; In short unless the stream of their importation could be turned from this to other colonies, as you very judiciously propose, they will soon so out number us, that all the advantages we have will not in My Opinion be able to preserve our language, and even our Government will become precarious. The French who watch all advantages, are now themselves making a German settlement back of us in the Ilinoes Country, and by means of those Germans they may in time come to an understanding with ours, and indeed in the last war our Germans shewed a general disposition that seems to bode us no good; for when the English who were not Quakers, alarmed by the danger arising from the defenceless state of our Country entered unanimously into an Association within this Government and the lower Countries raised armed and Disciplined near 10,000 men, the Germans except a very few in proportion to their numbers refused to engage in it, giving out one among another, and even in print, that if they were quiet the French should they take the Country would not molest them; at the same time abusing the Philadelphians for fitting out Privateers against the Enemy; and representing the trouble hazard and Expence of defending the Province, as a greater inconvenience than any that might be expected from a change of Government. Yet I am not for refusing entirely to admit them into our Colonies: all that seems to be necessary is, to distribute them more equally, mix them with the English, establish English Schools where they are now too thick settled, and take some care to prevent the practice lately fallen into by some of the Ship Owners, of sweeping the German Goals to make up the number of their Passengers. I say I am not against the Admission of Germans in general, for they have their Virtues, their industry and frugality is exemplary; They are excellent husbandmen and contribute greatly to the improvement of a Country.